T.11: two-seat training version for the RAF. Powered by a Goblin 35 turbojet engine; 731 were built by DH and Fairey Aviation. As an added note, it seems like Australia and Switzerland were two countries who built most of the license versions. They were also built in Italy and France. A nice part of the kit is a set of full intake trunking, culminating at a compressor face. There is room in the nose for the required 7 grams of nose weight. The fuselage halves do not include the upper section. 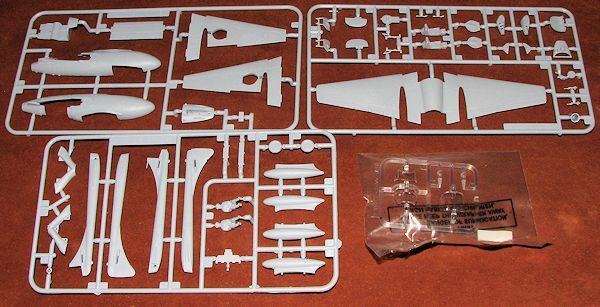 Airfix has molded the upper wings and the upper fuselage as a single piece so you do not have to worry about dihedral issues. The tail booms are so designed that they are complete and fit into notches in the rear of the wing sections. This should eliminate the issues many have with alignment and having a seam to fill right behind the wings. Landing gear are well done with the outer gear doors incorporating the extention/retraction brace. You have the opportunity to install tanks under the wings as these fuel-thirsty jets often carried them. Holes will need to be opened to use them. This is topped by a two piece cockpit covering. You can display the canopy section open if you so wish. 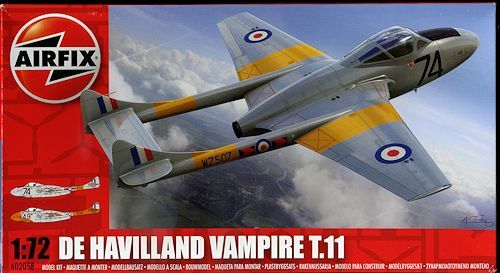 So if you like Vampires and have been hoping for a two seater in this scale, you now have a very nice one. 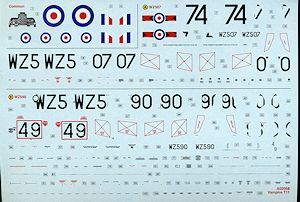 I am sure there will be aftermarket decals for this one as the kit markings are, well, a bit uninspiring.